This Limited Edition lithograph that is absolutely STUNNING, and suitable for framing! (It also might be called a Fine Art Print or Poster). We are ecstatic to be able to offer something we never expected. The band officially licensed this poster for their two-night stand at the world famous Hollywood Bowl in Los Angeles on October 2nd and 4th, 2015. This type of event poster is usually made just for the band, promoters, and other industry people. But now, for the first time in their entire career, the band is allowing a limited supply of these much sought after collector's items to be offered to the fans. 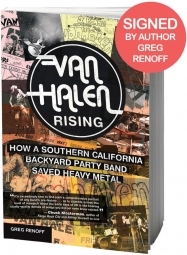 (It was NOT available at the Hollywood shows). 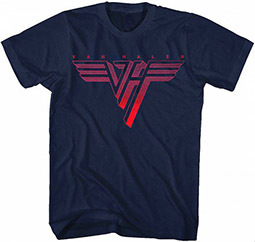 Designed by famous artist Kii Arens, who uniquely incorporated Eddie Van Halen's identifiable guitar stripes into the iconic Hollywood Bowl dome, under the starry sky above. More than a concert poster, this is a true work of art, classy enough to proudly display in your home, office or man cave. These are sure to sell out and retain their value as true collector’s items. This is, in all actuality, a work of art. 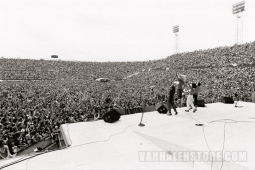 Although I was not as lucky enough to go to the show as ShawnaRae, I cherish it with all of my other Van Halen Collection's and Memorabilia. 😉 I recommend this highly..
Great Poster - and show! Love this poster so much - especially since I was able to attend the show on the 4th!